Hope for the Holidays is a service project sponsored by Timber Creek High School’s National Honor Society. It was started many years ago by Mrs. Woolley, former English Teacher, when she worked at Hillwood Middle School, and she brought the tradition to Timber Creek High School when she transferred. 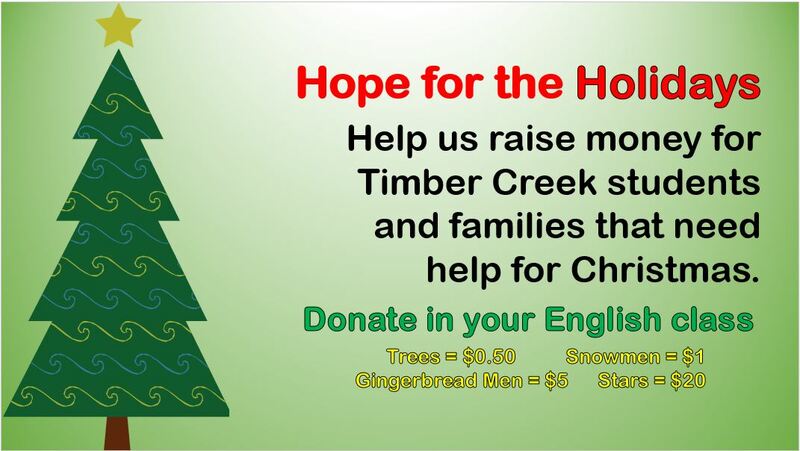 Hope for the Holidays raises money for students and families from Timber Creek High School that need help for Christmas. Last year, the students and teachers help NHS raise $5,600! That allowed us to provide for 3 teachers and 27 students. English teachers will collect the shapes from the kids and put them on their walls. If any additional teachers would like a Christmas tree to join in the merriment, we will be happy to provide one for your room. Teachers will tally the amount separately for each class, and maintain a running total. Students should write the period on the shape, in order to help the teachers keep track of funds per period.